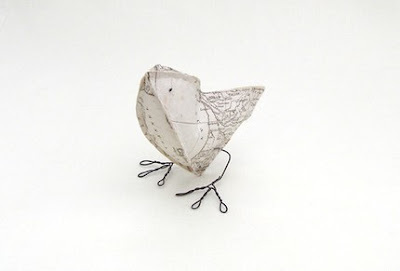 Bird + 'vintage' paper = very good step forward, as far as I am concerned. 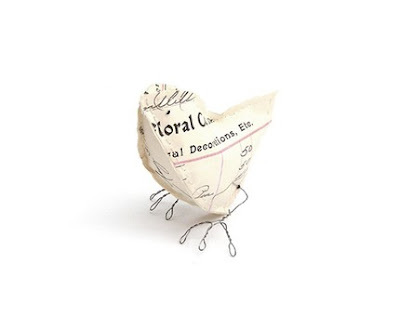 I love these little birds, made with vintage materials from Cotton Bird Designs. They are so pretty and delicate. This one is made with an antique map of France. This one is made with a florist's receipt, dated 1894. Have I saved the best until last? 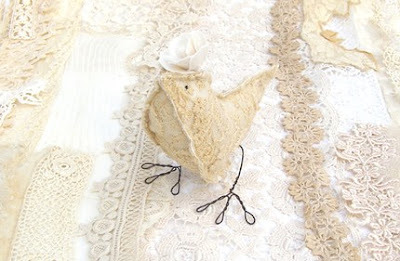 I think I am into word birds, myself, but I couldn't resist this lace bird, made with antique tulle lace and ivory satin. Cotton Bird Designs also takes commissions; I think these would make a beautiful present, if you had a copy of a favourite poem, or even a high quality copy of an old family photograph. The top is my favorite. I love that! Who comes up with these creations :) so unique. so lovely. These are too sweet! 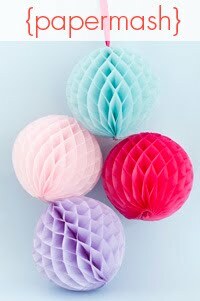 I love their little feet, and I can see them looking so adorable at a wedding or shower as table decor...you could use pages from a book of favourite love poems, even! I have seen these little cuties before and fall in love with them every time. I think I will have to get one.